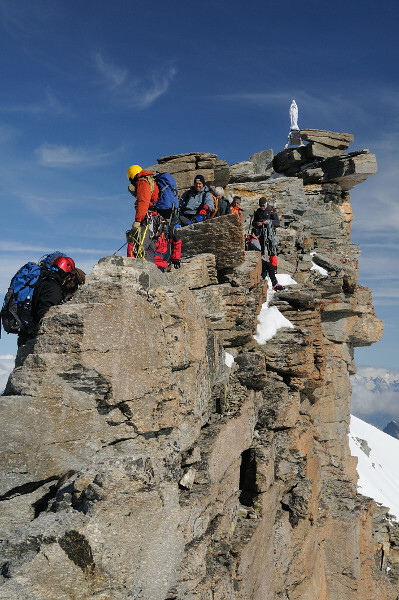 Mont Blanc climb itinerary – . The countdown is on, only 3 months to go until the Mission Summit Mont Blanc 2017 expedition and I wanted to share our climbing itinerary with you. We will meet our guides, get the equipment ( like harness, crampons, ice pick but also the mountaineering boots that most of us rent as they are very $$$, fingers crossed they have a comfy pair that fits me) and take a train to Mer de Glace ( “sea of ice”, it’s the largest glacier in France, 200m deep and 7km long) for altitude training and to practise how to walk with crampons on the ice. Leaving for Aosta Valley in Italy via the Mont Blanc tunnel ( approximate travel time 2h) where we’ll start a heavy 3h long hike to Rifugio Vittorio Emanuele II, a traditional Italian mountain hut first build in 1884 and as I was told, loved by sociable Italians who like to share their climbing adventures till late at night over a glass of red wine or two ( I already like that part very much or at least the idea as I guess I won’t be drinking 😉 ) – except the climbers who plan to summit the highest mountain in Italy early the following day which is the Monte Bianco aka Italian side of Mont Blanc. We’ll start our climb up the Gran Paradiso ( highest mountain entirely within Italy) by moonlight. The first hour of the tour is going to be tricky as we need to make our way through a very rocky terrain with big boulders. By sunrise we’ll attach our crampons and harnesses that connect us to the rope. Safety first! ( I hope it won’t be too scary, that’s why I’m already busy with taking climbing classes each Monday). The route leads us right over the glacier and the higher we climb, the steeper and tougher it gets (hmm). Once the sun is up we will hopefully have a great view to make up for all the hard work! After climbing a couple of hours we get a first glimpse of the top of Gran Paradiso. The last 100m to the summit ask for a lot of focus and concentration as we’ll reach the top over a very steep ridge of rocks – I guess by then everyone will know for sure if they are afraid of heights or not. ( After watching this video I’m not so sure of it anymore, kind of made me dizzy but I’ll find out!). On top there’ll be a picturesque 360-degree view on the Alps famous mountain range – if the weather plays along. Descent into the valley using the same (very steep and very scary) route , a quick stop at the hut for some food ( and most likely a sneaky sip of vino) and back to Chamonix/ France where we’ll arrive around dinner time. In the afternoon we’ll practise again some more rock climbing techniques for the ascent of the very steep Grand Couloir ( “large gulley”) at a local climbing garden. This spot is well known for accidents and notorious for falling rocks so it’s vital to learn some extra safety rules. It’s really the most dangerous part of the ascent/ descent and to be honest, I really fear and respect the “gulley”. Safety is of course our number one priority that’s why we chose for a very well known tour operator with many years of experience and great guides who will make sure we’re safe, for the Mont Blanc the ratio is 2 climbers / 1 guide and all other tours during this expedition 4 climbers/ 1 guide. After breakfast we depart to Les Houches where we’ll take the cable car to Nid d’Aigle ( “Eagle’s nest” 2372m), this is where the hike to Refuge de Tete Rousse (3167m) starts. The trail then passes rough boulder-strewn terrain and snow patches. After approx. 3 hours we should arrive at Refuge Tete Rousse ( 3167m). Once there our guides will discuss the strategy for the next day(s) over dinner and if the weather forecast is on our side, we’ll climb to the top of Mont Blanc the very next day! Day 7 ( Sunday, July 23, 2017) Summit Day! All fingers crossed today for good weather and a safe ascent to Mont Blanc! Rise and shine at 1 AM ( 😉 this will be a 10-12h climbing day!!!) A quick bite, drink and off we go, out into the cold dark ( usually -5 to -10 degrees in July), attached to ropes, on our way to the goal, the top of Mont Blanc. We’ll use headlamps that give just enough light to see where we can carefully place our feet. Via the steep Gran Couloir ( yes, we’ll do the “gulley” in complete darkness besides a tiny lamp on my forehead!) and attached to ropes we’ll climb up to Aiguille du Gouter ( 3817m) for a quick break at Refuge du Gouter before moving on to the glacier. If we’re on schedule the sun should be coming up slowly behind the mountain range at this point and we’ll finally see our goal – the summit. The next part of our route runs from Dome de Gouter (4300m) to the Vallot shelter (an emergency bivouac that sleeps up to 12 climbers) , from there it’s “only” 400m climbing over the very narrow ice ridge “Arete des Bosses” ( picture that crazy ridge of Gran Paradiso but then with snow 😉 ) to the top of Mont Blanc ( 4810m). Afterwards we return to the Gouter hut ( approx. 3800m) for some well deserved rest and a good night’s sleep. This is an extra day in case we couldn’t attempt to climb the summit due to bad weather, Mont Blanc is known for its almost unpredictable weather and especially strong winds. From the Gouter hut it’s “only” a 1000m climb, an advantage and great chance for a second summit attempt. Otherwise/ and this will be the day we descent to Chamonix and we should arrive at the chalet in the afternoon. Finally time for a shower ( will be the first one in DAYS) , fresh clothes, a delicious meal, for sure some wine and time to reflect and CELEBRATE. Celebrate us, our personal, small win against our fears and MS but hopefully also that we hit our fundraising goal for “Study Y” to get a step closer to understanding this disease.